Click on either picture to popup an enlarged version. Quite by happenstance blog favorite Charles Winpenny has managed to dominate today's edition, with entries in this section and in 'On This Day in 2002'. Charles has only recently returned from a trip north into Scotland from his home base in the far south west of England. Sigh, he most probably passed through my own hometown of Carlisle, the last city 10 miles before the Anglo-Scottish border. Mostly, except of course to welcome Charles' return and resumption of his web site, this item is for a correspondent in Australia, who expressed a long held desire to spend a vacation afloat after seeing the item on Terry Smith's excursion to Skipton, which is a town on the Leeds-Liverpool Canal. 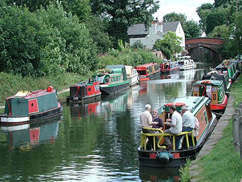 On his way north Charles stopped off at Lymm, in the English county of Cheshire, which is on the historic Bridgewater Canal. Those who followed the links given yesterday for the abbreviated history, or Mike Clarke's more comprehensive history, will already know the special significance of the Bridgewater Canal. At the end of his northwards journey, Charles hove to in Fort Augustus. This town is on the Caledonian Canal, which crosses mainland Britain from sea to shining sea. Thomas Telford was the designer: another man revered in the town of Langholm, near to the place of his birth and site of one of his early undertakings, just like astronaut Neil Armstrong, who was the subject of one of yesterday's items. 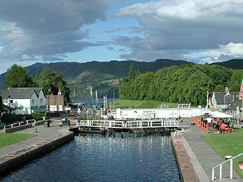 Detailed information on the Scottish canal system is available on the ScottishCanals.co.uk web site. American artist (1928-1987). This man was considered by many to be the most outrageous artist of his day. Although almost fatally wounded in a 1968 shooting incident by assailant Valerie Solanis, a member of SCUM (Society for Cutting Up Men), his death occurred in 1987 during what was meant to be a routine gall bladder operation. Presumably Valerie was someone who was unable to distinguish between knives and firearms as things of purpose. One of his paintings and one of his quoted sayings are sufficient singularly to identify him to millions, but his output was vast: naming his studio 'The Factory' acknowledges that industry. His 16mm movies have become underground classics despite requiring an enormous attention span from viewers, such that even we were unable to muster one sufficient. While we are at the beach we thought we may as well pop down to see Charles Winpenny, whose CornwallCAM.co.uk visited Portreath on the first Saturday in August. Charles also visited Rosewarne, near Camborne, on the following Monday when he was in Marazion and Penzance, where he was able to photograph some beautiful wild poppies. Sight of these always stirs me to write poetry, but as a recent entry in the Guest Book suggests, I am somewhat of a "little hinkey". Ach well, it's just something that I will have to learn to live with, because it's too late to learn new tricks for this old dog.